Paneer is an Indian cheese made from Milk. 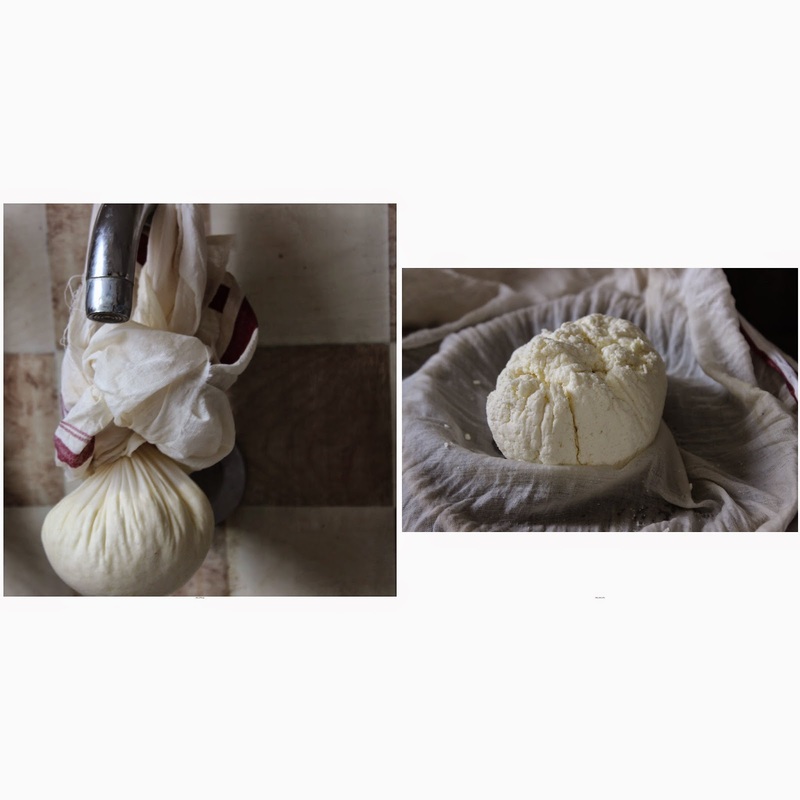 Paneer made at home will be soft and spongy. It enriches extra taste to Paneer gravies. 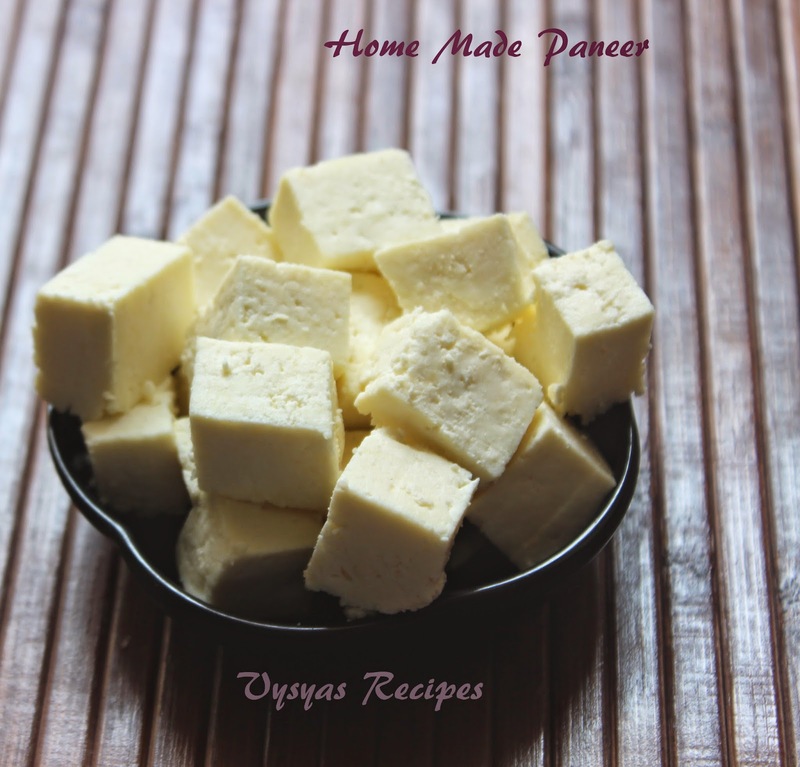 It is easy and simple to make paneer at home.No we will learn to make paneer at home with stove top.After making paneer you can refrigerate it even for 3 - 4 days. Full Fat Milk - 1 litre. Lemon Juice/curd - 3 tbsp. Boil the Milk, when Milk raises, keep the stove in sim mode and add Lemon juice. stir the milk, so that it does not stick to base. When milk curdles completely, drain it in a cheese cloth or muslin cloth as shown in the picture. Then gather the cloth, and hang it for 30 to 40 minutes. ( keep any vessel under the cloth, to collect whey water.you can add whey water to make chapathis or to cook veggies. Adding whey water gives softness to chapathi's.). squeeze the muslin cloth once or twice in between to remove excess whey water. Place Muslin cloth on Plate, then keep heavy object on it, as shown in the picture to set Paneer. ( I kept mortar and pestle). Let it rest for 1 hour. Then, open the cloth, soft spongy paneer is ready. Draw lines into desired shape using knife. you can store paneer in a refigerator for 3 - 4 days. Paneer butter Masala ,Paneer Peas Masala, Paneer-bhurji , Paneer Korma,Kadai paneer , Palak Paneer and much more. Milk may not curdle if lemon juice is not sufficient. when whey water starts separating, stir well, else milk may stick to base of the vessel. Make sure that,whey water drains from curdled milk completely,else paneer will get crumbled. you can also use curd or vinegar to curdle the milk, but i prefer lemon. I used aavin Green to make this milk. you can also make it with 2 % low fat milk. Very nice step by step pics and nice brick of paneer. perfectly made!! looks so soft!